In a surprise development many supermarkets are using large tax incentives to become one of the first major building categories to reach net zero electrical consumption from the electrical grid. A building gets to net zero electrical consumption by reducing overall energy consumption and installing alternative energy measures to generate the remaining electricity that is required. Supermarkets have historically been one of the highest energy usage building categories because in addition to normal building lighting and HVAC they require even larger amounts of electricity for refrigeration and freezer applications. Supermarkets are increasingly using LED (lighting emitting diode) lighting to reduce building energy usage and fuel cells to generate the remaining electricity that is required. Pursuant to Energy Policy Act (EPAct) Section 179D, property owners making qualifying energy-reducing investments in their new or existing locations can obtain immediate tax deductions of up to $1.80 per square foot. If the building project doesn't qualify for the maximum EPAct $1.80 per square foot immediate tax deduction, there are tax deductions of up to $0.60 per square foot for each of the three major building subsystems: lighting, HVAC (heating, ventilating, and air conditioning), and the building envelope. The building envelope is every item on the building's exterior perimeter that touches the outside world including roof, walls, insulation, doors, windows and foundation. There are multiple 30% or 10% tax credits available for a variety of alternative energy measures with varying credit termination dates. For example, the 30% solar tax credit and 30% fuel cell credit expires January 1st 2017 and the 10% Combined Heat & Power tax credit also expires January 1st, 2014. The 30% closed loop and open loop biomass credit expires January 1st, 2014. A Light Emitting Diode (LED) is a semiconductor device that converts electricity into light. LED lighting has been around since the 1960s, but is trending to make major inroads in the commercial building lighting market. The commercial marketplace for LED bulbs is forecast to exceed $5 billion in 2012, corresponding to a compound annual growth rate (CAGR) of 28% from 2008 to 2012. For supermarkets, overall energy cost is a very large operating cost that can be managed. Energy costs related to refrigeration and freezers are the biggest energy cost user in addition to the lighting and HVAC costs for general building needs. Appropriate lighting is crucial in supermarkets for product presentation particularly for increasing volumes of fresh foods including seafood and produce. LED lighting is very energy efficient and works very well in cooler temperature environments. Fuel cells convert chemical energy into electric energy through use of a reactant (hydrogen fuel cells use hydrogen as a reactant) and an oxidizing agent. Combustion is not involved in this process, making fuel cells quite environmentally friendly. 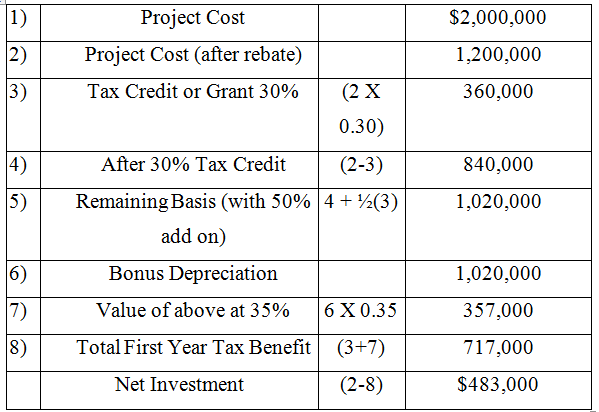 The following example illustrates the potential incentives related to the 2011 year $2,000,000 fuel cell investment with a $800,000 utility rebate. Supermarket tenants who qualify for 100% bonus deprecation must complete their LED building lighting project by December 31st 2011. Supermarket tenants who qualify for 50% bonus depreciation must complete their LED building lighting project by December 31st 2013. Supermarket owners who want to use EPAct must complete their LED lighting project by December 31st 2013. Due to their very high electricity usage Supermarkets can sometimes achieve 5 to 7 year economic paybacks from fuel cells despite their high first cost. These paybacks arise from combining electrical cost savings, large utility rebates, 30 percent tax credits and large short life depreciation tax deductions. •Supermarket who seeks 30% fuel cell cash grant must comply with 2011 tax requirements. •Supermarket who seeks 30% fuel cell tax credit must complete by December 31st 2016. 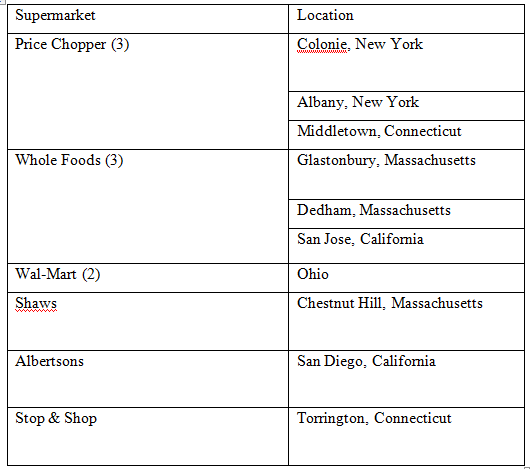 •Supermarket who seeks 100% fuel cell bonus depreciation must complete installation by December 31st 2011. •Supermarket who seeks 50% fuel cell deprecation must complete installation by December 31st 2012. Supermarkets seeking the $1.80 per square foot warehouse tax deduction must complete the project by December 31st, 2013. Supermarkets that achieve net zero electricity usage have a tremendous competitive advantage. Tax advisers that represent property owners in these building categories need to understand these exciting developments if they want to stay relevant. Supermarkets have an unparalleled opportunity to use large tax savings to drive towards the net zero electrical energy goals. Those who choose not to and face competitors who do may find themselves at a precarious operating cost disadvantage.